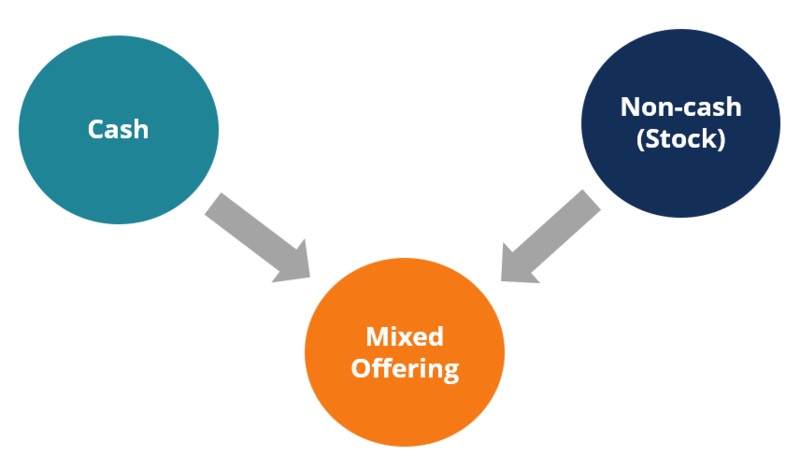 What is a Mixed Offering? In merger and acquisition transactions, a mixed offering (also known as a mixed payment) is a form of payment in which an acquirer uses a combination of cash and non-cash payment methods (e.g., own equityEquityIn finance, equity is the market value of the assets owned by shareholders after all debts have been paid off. In accounting, equity refers to the book). For example, an acquiring company employs a mixed offering if a portion of the deal is paid using cash while the rest is paid through a stock-for-stock exchange. A stock-for-stock exchange is a form of payment in which an acquirer exchanges its own shares for the shares of a target company at a predetermined rate. A mixed offering is one of three payment methods in mergers and acquisitions. The other two payment methods are the all-cash method and all-stock method. Generally, the method of payment selected by an acquirer provide some valuable insights regarding the acquirer’s perception about the ability to realize synergiesTypes of SynergiesM&A synergies can occur from cost savings or revenue upside. There are various types of synergies in mergers and acquisition. This guide provides examples. A synergy is any effect that increases the value of a merged firm above the combined value of the two separate firms. Synergies may arise in M&A transactions from the upcoming deal or about the value of its own equity. For example, if an acquirer believes that its own equity is overvalued, it would likely prefer an all-stock payment. At the same time, if an acquirer strongly believes that it would be able to realize the synergy potential of the deal, it would prefer an all-cash payment to reap all future benefits. Nowadays, mixed offerings are a prevalent payment method in M&A dealsMergers Acquisitions M&A ProcessThis guide takes you through all the steps in the M&A process. Learn how mergers and acquisitions and deals are completed. In this guide, we'll outline the acquisition process from start to finish, the various types of acquirers (strategic vs. financial buys), the importance of synergies, and transaction costs. For major deals, it is probably the only available type of payment. The popularity of the mixed offering method can be explained by its flexibility. An acquirer who finances the deal using mixed offering may experience the benefits of both cash and stock payment at the same time. The bigger the deal, the higher the possibility that an acquirer will employ more stocks than cash in their payment. The key disadvantage of using equity as a payment method is the dilution of ownership. If an acquirer does not want to affect the ownership structure significantly, the mixed offering will consist mostly of cash that does not affect the ownership stake. Similar to the ownership considerations, the type of payment also influences corporate governance. An acquirer that is not willing to significantly change its corporate governance would prefer a larger portion of cash over stock in its mixed offering. Essentially, free cash flows indicate the availability of cash within a company. Thus, acquirers that are without substantial cash flows will likely put more weight on the equity part in the mixed offerings. The stage of developmentBusiness CycleA business cycle is a cycle of fluctuations in the gross domestic product (GDP) around its long-term natural growth rate. It explains the expansion, peak, recession, depression, trough, recovery, expansion, and the entire business cycle keeps repeating in this loop. See examples and descriptions of the stages. of the target company can also affect the mix of cash and equity in the mixed offering. The cash payment in an M&A transaction increases the total acquisition costs for an acquirer due to the immediate tax payments. The taxes due can add to the acquirer’s existing tax liabilities. In February 2014, Facebook Inc. announced the acquisition of WhatsApp, a cross-platform mobile messaging company. The total value of this acquisition was around $19 billion. Facebook executed the deal using a mixed offering payment method. The social media giant acquired all outstanding shares and options of WhatsApp in exchange for $4 billion in cash and $12 billion of Facebook Class A shares. Additionally, Facebook granted $3 billion in restricted stock units to the employees of WhatsApp. In October 2016, AT&T Inc., the US telecommunications and entertainment conglomerate, announced the acquisition of Time Warner, a multinational mass media and entertainment conglomerate. The total value of the equity acquisition exceeded $85 billion. The deal is an example of a mixed offering because AT&T used the combination of cash and stock payments. According to the terms of the deal, the shareholders of Time Warner received $107.50 per share. Half of this price ($53.75) was paid in cash, while another half was paid in AT&T stock, with the price per share at $53.75.